Nice point about cell phones. I, for one, am sick of it. Wow…human contact and face-to-face interaction, huh? What a novel concept. And it kinda annoys me that billionaires are making such a big deal out of not needing/wanting their phones. I would, too, if I had unlimited resources at my disposal. But until then, the ability to talk to my children “trumps” that argument. Thank you for this post! It’s always nice to see how foreign people see my country! I’m Italian and now I live in North America …. I blog about how I see America through my Italian eyes. Pass by if you’d like! I’ve been thinking about this a lot as well–our addiction to cell phones, computers, internet, social-networking sites. I think it’s destroying society. I for one am trying to figure out how to go back to the days without it all. But then I remember the bills; I don’t want to pay those by paper. And of course writing; Computers and WordPress, I’ll keep. I would love a world without cell phones. I hate that we have become so reliant on them. Nobody can ever relax anymore because they are always constantly checking their phones. I wish we could spend more time on face to face communication because I miss it. People don’t even leave messages anymore…they just send texts…what’s happening? On the one hand, I rarely use a cell (hate the things, though do carry one). But in Italy–where I didn’t spring for a cell, and thought not having one led to a number of ‘fun’ and interesting mishaps–it seemed to me that just about everyone (especially the younger people) had them. People ’round the globe, Europeans especially, have hardily embraced cells (assuming they can afford them, and many can). And although I did enjoy all the talking and contact I had in Italy (stumbling about with my rudimentary Italian! ), truth be told, I enjoy the face to face contact I have here just as well. I’m a talker…and I’ve found that just about everywhere I’ve gone–here and abroad– if I’m friendly and outgoing, others respond in kind. Technology has given me pause as of late as well; Italy, too. i am headed out of the country for a week this sunday, and since i cant afford international calls, my cell will be off…and i. cant. wait. I know a handful of people who gripe about cell phones but who don’t have the sand to get rid of them. I ditched mine about a year and a half ago and have not looked back. I also barely use e-mail anymore, as I prefer actual letters and conversations. About a year ago I opted out of Facebook, too. The only computer communication I really do anymore is keeping a blog. I would rather talk to a person face-to-face, and I don’t like seeing families or couples at restaurants on the phone with other people. It is obviously a free country, though, so while some use their time glued to a cell phone, I don’t. No thanks. It’s amazing Bill many of my long term friends who are checking out life on the other side of the “big pond” are reporting the same thing. “I actually feel relieved to feel human again”. I use my cellphone very little, but I like having it with the number programmed in, which helps when I am in a hurry. I do wish people would talk face to face more, though. Since giving up my cell phone…I feel I got my life and sanity back :) Love this article. It was hard though, as my friends were upset about it. I’d rather be contacted by email. It just doesn’t make me feel so shackled. I do have a private shared one just for emergency use though – in case I am stranded somewhere. That sounds lovely. I must carry my cell phone with me for work purposes, and it is a burden. I really wish I could give it up. Perhaps I can at least start powering it off on the weekends. That would certainly help! mmmh foreign tourist could have some problems with their cell phones and their telephone companies or because they can’t find easily an internet connection but these points don’t mean people in Italy don’t use cell phones like other people . I know people who own (and use )2 phones at the same time, people who spend their days watching what other people is doing via facebook! Hm, the only people who make a deal over not using cellphones are already so powerful that they can make other people contact them the way they prefer without concern. Whatta coinkidink. I’ll keep mine. It only turns into a leash if you let it. I keep threatening to get rid of my lease called a cellphone…I remember the day I forgot it at the house and after the initial panic, I enjoyed being disconnected and people not having immediate access to me. I often wonder how we survived having to wait until we got home in the evenings after school and work to catch up with friends and loved ones. *dream sequence music* Good post! I agree that not using a cell phone is a good way to control your life. I have a cell phone, but i am using it rarely, just to let my host mother(i am an exchange student right now) to know where i am and that all is o.k. , but the only thing which is contradictory about italians is that they do speak a lot face to face, but also for example my italian(!) host mother can speak 2 hours on phone without a break. I hadn’t seen anyone before, who could speak for so long time on a phone. And at italian school everyone is using their cell phones during lessons(even if that’s not allowed). I think that’s why I’m lucky to live in a place without cell phone reception (though it’s creeping across the town’s border). When I see my family or friends with their cell phones it really feels like watching a gerbil pushing for a pellet. Removing your phone to disconnect seems like a great idea. And now I want to go back to Italy. Thanks. Great idea. Like not having a car in a society that doesn’t have decent public transportation. Do you realize the people you listed that don’t have cell phones are all either rich or have totally “made it” in their professions? Try getting a job without a cell phone. Try having your car break down on the freeway with no way to call for a tow truck. Try having a job where your boss calls you on the cell phone when you are out at the job site. Dream on. I don’t like cell phones, but I had to get one or I could forget having a job. I confess I’ve called the teenagers on their cell phones instead of getting out of bed to wake them for school and to come down to dinner. It is more civilized that shouting and less disturbing to others in the house. With that being said, I also hate the phones as answering the call and texting takes precedence over one on one interaction and I find that rude. I live in a rural community in New York State, everywhere you go is a social outing: the post office, the supermarket, the home improvement store or the gas station/convenience store. You could be socializing with the clerk, old acquaintances, the neighbor down the road, a friend from church, a young person one of your children were friends with, or the parent of someone who played sports with your child. The list is endless. Give yourself an extra half-hour for chatting. The Italian’s would love it here. Life is a very different experience without a cell phone. I am often reminded of this when travelling aboroad without my US cell phone. In any case, congratulations on getting FP ! on January 7, 2011 at 8:18 pm Alan W.
You have made some very interesting points here! My sister recently went to Italy, and she told me about how different the lifestyle there is compared to here in America. She said people in Italy tend to be more relaxing and chill. Whereas Americans are typically fast-paced–think about New Yorkers. 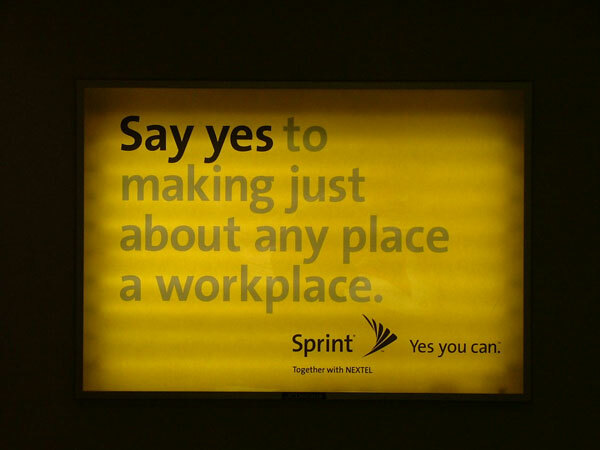 According to the Sprint ad you show above, cell phones seem to serve as a symbol for busyness and work. The fact that many people in Italy do not have cell phones just makes their lives seem so much better, stress-free. My sister also told me that restaurants in Italy have a three-hour break in between their lunch hours and dinner hours. They are truly living their lives. What is the need for technology if we can appreciate even the simplest things on earth? I don’t use a cell phone — at least not the way many of the people I know do. I have one, I don’t give out the #. It’s in my purse for emergencies (when driving), or to quickly call my husband to tell him where I am if I am late, etc. Or perhaps to quickly check on an appointment. But I don’t use it for conversation, and very few people have the #. It’s turned off when not in use, and frankly, when it rings I am irritated — unless I am expecting a call. I find the “need” to be constantly available wears on my nerves and I want no part of it. For many years before cell phones I was reachable, and even then I had voice mail and if I didn’t feel like answering my phone when it rang, the call went there. We fool ourselves into thinking everything is an emergency, or that we’re so very important to be wanted constantly, when really I, at least, find all that immediacy and constant “communication” to be an irritating bother. It’s not that hard to take control of your life. I remember growing up when I walked down the street (in Texas, and yes, we walked!) people looked at you, they said “hi”, or “how are you” or “good morning”, and these were not people you knew. It was an eye contact/respect/ friendliness sort of thing. Still now when I walk in Manhattan and hear single people talking I instinctively think they are addressing me — but no, they have a little earpiece in their ear and are completely disconnected from everyone/everything around them, and are just carring on some inane conversation for all the world to hear. I believe in using my mobile (sorry but i’m british) in moderation. If i’m running late, if i need something to be picked up in the store, if i’m waiting for an interview call back and occasionally a nice chat with a friend you that’s a bit more than a 10 minute car ride away. But i really can’t stand blackberrys and iphones. It just seems ridiculous to listen to music, email, bbm, go online when you’re having a meal with a group of friends and they feel the unrelenting need to update their facebook status through their phone, or for someone to check their email when they’re in a lecture, or blasting their music when i just want to do my grocery shop in peace. Then again, i’d be totally lost with my mobile if it didnt wake me up every morning and told me the time when i’ve forgotten to put on my watch. Thanks for your excellent post. The old country! I am one of these individuals who do not have a cell phone. What gets me when someone walks into my office for an appointment and their cell phone rings. They have to answer it! I sit there looking at my computer screen as they jabber away. I see people driving and talking on their cell; I have been rear-ended by these cell talkers. Many times I move out of the way of someone on their cell on the sidewalk since they are in a different zone than me. I tend to make eye contact and smile at people as I walk. I have never seen a person talking on their cell and smiling as they pass others. I couldn’t agree more–real players don’t need to carry a cell phone around everywhere, and I’ve found through personal experience that doing with out it can be a liberating experience–see my blog, “Ditch Your Cell Phone and Run” on WordPress. Take Care. The world would be much better without cell phones. People never get the time to sit and breathe or reflect because they are always bombarded with information. Facebook, Twitter, and emails are all sent to cell phones. Instead of having to be at home to access them they can be accessed at every minute of the day. And not only that, when people are face to face they don’t take the time to talk and build a relationship they are lost in cyber world. I think it should be noted though that cell phones aren’t the problem (they have a lot of benefits) but they way we as people decide to use them. Cell phones a scourge? Not really. All it takes is a little self-discipline. After all, technology is here to serve me, not the other way around. Just because my phone rings or a text-message arrives does not mean I have to pounce on it. In fact, after a certain time every night I turn the little blighter off. So, for those who wish for no cell phones… maybe they should wish for some self-control instead. I hear myself saying ” you know when we were kids…..we didn’t have cell phones, computers or any of that stuff.” Never thought I would be so addicted to my phone now. If I leave the house and forget it I feel like I have to turn around and get it because I know I’ll probably get a flat tire or something if I don’t. But seriously, on vacation in Italy? Who would I need to talk to so bad and miss out on one minute there? Absolutely no one. You are right, if you just want to think “local”. But most people nowadays think “global”. That is why it is very easy to sell technology to them. i tried a one-week vacation this holiday season without cellphones. well im still alive! I wouldn’t like to disappoint you, but I am Italian and what you said it’s definitely not true. Everyone has got a mobile and we spend hours texting and making phone calls. When I lived in the US there were fewer people using it (compared to Italy). I didn’t get to know little kid when I was in California, but in Italy usually everyone gets a cell phone when is 9 or 10! Anyway it’s always nice to see how Americans see Italy! I took a two year break from cell phone. It wasn’t on purpose. My old one broke and I got tired of fixing it, and finally, I just quit worrying about it. It was hard at first, even though I only basically used it to keep in contact with my children. As a single, working mom, I needed to be available to them at any given moment when they were younger. But they were teenagers by the time my phone broke, and so I thought they could handle themselves okay if anything happened. They had their phones and could always call me since I was never anywhere but work or home. And if they couldn’t get a hold of me, they had plenty of back-ups. It was hard at first. Just knowing you have that phone for an emergency gives you some feeling of security. But, after a while, I just kept telling myself that they didn’t have cell phones when I was growing up and we did okay without them. It was freeing, actually. Just like when I gave up wearing a watch (no more constantly worrying about and checking the time)! I just found this blog and it’s really nice! I really love to read how foreigners see us and our habits. We don’t think about how peculiar some things might be for others while we don’t even think about them! I hope you will keep having a great time here in Italy! It’s an interesting concept to be able to relinquish your mobile phone. (sorry, I’m Australian, we call them mobiles). I like the idea that then it would force people to actually talk to you. And there are so many brilliant things about Italy, but the camaraderie between perfect strangers is one of those things that you really miss when you get back home. Nice! I hope it remains this way. I hope to visit one day! I have a cell phone which is more or less needed for occassional work calls but I very rarely use it.What I dislike is the constant texts and videos trying to get me to download a whole heap of stuff such as news t.v. shows etc. that I really do not want.I would like one that only makes phone calls and texts. But they are difficult to find. I loved your post. I live your post. In the US I do not have a cell phone. I hate the “call me before you leave and then when you’re on your way and then while you’re waiting and then on your way home because you forgot to tell me something.” Just meet me. I don’t need to stay insidiously in touch. Blechhh. I’d be a Luddite, but the Amish have better hats. I lived in Italy, in Pavarotti’s home town of Modena. In Italy, I bought cell phones, from a wretched wench I called “Phonezilla,” (the only truly mean person I met in Italy)> But when I needed to use the phone, the battery was dead or whomever I called had their phone turned off. They’re called cell phones because you always end up talking to yourself. Italians do talk to each other. In lovely clothes, in gorgeous places, and the sound of the language is like a river of mahogany. And weirdly, Italians don’t need cell phones for emergencies, because ambulances actually troll the piazzas. Why? Are they looking for business? ?? So fun. I wrote about the gorgeous fun of living like an Italian – at 4initalia – and I can’t wait to read your blog. Cell, to have or not to have. I don’t have one, too much technology in that little box. My husband has one and it is great tool while travelling, instead trying to find a phone and phonecard and how the heck do the phone work in country! Assuming we get it working before the last day in what ever country we are in :) Just love Italy. Just love Europe! In the post you write that “It is amazing for them to see the person-to-person exchange that goes on everywhere, all the time”. Beware: not everyone is comfortable with this exchange which goes on all the time. A shy person would have a very hard time, and in a country where speaking is fundamental for living, that could mean trouble. What I’m trying to say is that this exchange is annoying sometimes: I’d like to stay alone, but I’m forced to “interact” (I don’t say you can find this kind of problem only in Italy though). I wish I had the courage to do that. There’s just those couple times a week when you absolutely need it, and I don’t know if I could give up my baby on a permanent basis. This is awesome! I’m only 16 but I think I might do this some day! I’ve never run into this problem, though I came into getting a cell phone well past the curve. “Having a cell phone” does not have to mean carrying it with you at all times, having it “on,” or even checking it more than twice a day. We have voicemail now, leave a message! Always have a great time in Italy and am lucky enough to visit 2 – 3 times a year! This is quite true and I love the article for it. Not only is this in Italy. In India, places as grand as Kolkata is like this too. It’s use of trams (the old styled ones) and also the rich street culture makes it easier and feasible to chat, eat and travel. The urban landscape may be awesome but it is unfortunately overwhelming and tiring and mundane as well. It becomes too plastic at times and leaves much to be desired. Cell phones are destroying life, especially the life of the young. It is taking them to places where they are not needing to think or make their own decisions. The cell phone should be carried and used only in dire emergency. What will happen when there is a strong burst of solar activity, that knocks out all such communication ? I only use a mobile if I actually need to make a call or I am expecting one. The rest of the time it is turned off. I spend 6 months a year in Italy (the rest of the year I am in Australia) and you are right, Italians talk to each other. They talk in buses, trains, in the street – it’s great. I love my time in Italy. Italians also talk on mobile phones all the time. Interesting. Italy. Wow, who would think? I’d love it if people everywhere started depending less on electronic devices, but even I’m attached to my cell phone day and night. Sigh. Congrats on the Freshly Pressed! Damn…I’d be the guy with the Mobile while everyone wonders what’s wrong with me! I’m just nerdy…gimme a break! I also found Italy to be a seductive place, due to its delicious food, romantic countryside, historic sites and the very warm people. Thanks for the post. Cell phone usage has been out of control for some time. It isn’t just about using cell phones, it is how they are used and how much they are used. If the usage was for necessary communication, things would be so much better. When you see people in our small town going to the grocery store with blue tooth devices stuck in their ears and talking, it drives me crazy. I don’t want to be part of their private conversations and they also run you over with their shopping carts because they are not paying attention. It is illegal in my state to drive while talking if not hands free but, you see so many people risking an expensive fine and other peoples lives over a phone call that can surely wait. I hate to say it but, it is a sign of the inconsideration that many people show to those around them. I believe the way most people use their cell phones is rude and selfish. Cell phone technology is a wonderful and useful thing but just like most things in America, we have taken it to extremes. Nice posting. It expresses what everybody is thinking, why not giving up your cellphone. OK people, do so. Why not? Actually not very much reasoning behind this in connection to Italy IMHO. Italy is one of the countries with the highest per capita rate on cell phones, ranking #4: just about 91 mobile phones every 100 citizens (of course there have to be that many, because most of them are permanently switched off, in favor of the good old face to face). BTW The US rank in #29 with 49 mobiles per 100 citizens. seriously, have you ACTUALLY ever set foot in italy?!?! ‘subtle’ is indeed the last epithet to fit that noisy country that they call the ‘belpaese’. and italians were among the first europeans you could see talking alone on the streets – in fact, they were using their cellphones, without however giving up their habit of ‘subtly’ gesturing with their hands. interisting. nice to read this note ..
Not so sure cell phone usage is THAT limited in Italy, but I very much enjoyed your comments. I moved to the UK about five years ago and never actually bought a mobile phone here, just kept on using my old one, which I’ve had for ages. Then, eventually, my ex-boyfriend got sick of having to listen to my voice mail every time he called (poor battery life, I promise!) and decided it was time for me to have a decent phone. After four years, I still have that same mobile, never switched to a contract phone and always leave my Italian sim-card behind whenever I go back home: as long as I can see the people I care for and have face-to-face chats with them, I am sure I don’t really need a mobile on me. To be honest I don’t quite follow your article, as having moved to Italy some years ago I would say that Italians use mobiles as much if not more most! Yes they talk to each other face to face , but will often carry two mobiles, and often without any ‘excuse me’ will break off in mid conversation to answer a call as if it is the most important thing in the world which it might be but usually isn’t. I live in a small village here in Umbria and it’s here as much in the cities: though it is charming to see the 80 year olds in the village chatting to their grandchildren on their mobiles . . . I love in Italy but I don’t think it can be held up as an example of not being ‘slaves to the mobile’ . . . they love them!!! The only thing i hate about cell phones is when somebody who’s hanging out with you spends all his time texting somebody else instead of talking with you: that’s just stupid! I like the idea of not having a cell-phone but in practice it would not work. I also like the idea of earning a passive income. I need to be available for work or to help in emergencies. If I am busy, for example in a meeting, I will not answer the phone. This forces the caller to leave a message if needed. If I receive a missed call but no message then I will assume it was not urgent. I do not admire Warren Buffett for this move. He is exploiting his position knowing that people will bend over backwards to suit his demands. One cannot simply boycott the cellphone and expect to remain in contact through e-mail and sticky notes. You forget that Italy is the European country with the biggest number of cells per person… Maybe in Orvieto everything is still so Medieval and romantic, but things are quite different in most of the other places, and everywhere I go I see people interacting with their cell, not other people! Lovely post, it really highlights how cell phones don’t facilitate quality human interaction for the most part, which is kind of ironic for a communication device! The worst of all worlds has got to be cell with internet, so people can contact you anywhere and in some industries you’re expected to reply any time of the day or night! I have friend who doesn’t even turn it off or on silent when she sleeps. We need a bit of head space sometimes. I could not possibly LIVE without my cell phone…. it has become an extension of ME! Sad, but so very true! Interesting. Having lived in Italy for 5 years I can’t stand that you can’t go anwhere (cinema, beach, theatre, opera, bar, friend’s house) without the Italians being on their cellphones the entire time. I’ve sat through entire conversations in the bar with 6 people showing each other every single i-Phone they have before promptly phoning mamma/girlfriend/lover/buddy to recount some banality surrounding the previous night’s football match. But yeah, face-to-face, love that you think its a concept that only exists in Italy. I live in Italy and I need a Free WiFi anywhere. Love this blog and the truth of it! “I will send a boy when I get in town. Does this mean the men don’t hold hands walking anymore? In ’73 that impressed me almost as much as the girls not shaving. I just came on board blogging wordpress today. virginvalleyopal.com or some similar link..I’ll call you. Just got back from Italy. Never have I seen so many cell phones in my life. Worse thsan here in the states. Surprising how we have such different vewpoints? Your post is excellent.It would actually be great to see people sans a cell phone literally stuck to their ear. But if one thinks practically, is it really possible to “abandon” the cell phones? What about emergencies, when you desperately need help and you are not at home next to the lap tops. Well, I feel we should not suffer from cell-phone-the-way-of-life mania, but having one for urgencies or rare calls is quite a necessity. Don’t you think? Not just the cell phone, this new year’s has affected my television viewing habits. I haven’t turned that on for anything other than the playoffs, which, now that they are over, weren’t worth it. All my teams lost. So it’s no more cell phone unless I’m out of the house, and only then will I turn it on. I’m on sensory overload and trying to calm down. I don’t use a cell phone. I have a Tracfone just to turn of when I am away from my house only in case my son’s school has to call me. I leave it in my car and turn it off the minute I pull into the garage. I don’t give out the number to anyone, only the school. Did you know that you don’t even need a cell phone service in case of an emergency. They all dial 911. I really hate seeing people drive and use a cell phone. This one car almost him my car the other day. I look over and she is texting while driving. yeah after reading your post out, I decide to make less use of cellfones…. I am from India. It has become a fashion to own a cell phone. It is not difficult to live without a mobile. When I was post to Mumbai from Bangalore, I lived without a mobile for a year. It was a nice experience. I lost my mobile a few months back and did not bother to buy one for a month. I bought one only after my friend said he will buy one for me if I dont get one in a day or two. A lot of junk calls reduced as a result of giving up the mobile for a month. I work at a clinic. The aging population and anyone sick I suspect would hate it if doctors decided to keep their phones turned off and were unreachable. olive oil and balsamic vinegar sprinkled over tomatoes and basil and cheese slices….. in the summer months in Manduria, folk racing against the sun..scurrying about to finish business early morning before the scorching rays rain down…but never too hurried to gift a foreigner with a smile…. capaccino, aaaaah with just the right amount of cream……olive trees with arthritic looking joints that have witnessed many stories….hospitality, openness, passion, smiles, genuine joie de vivre……yes….that is my Italy…….. I just use my cell phone for emergencies and ordering stuff for business. Other than that, I’m quite ol fashioned. When I spent 3 weeks in Italy, I left my phone in the States. I couldn’t use it because of high, high rates through my service provider, so all I had with me was a phone card and my laptop, which never got service. So, for three weeks, I had nightly phone calls to my mom, and that was about it! I was forced to immerse myself in everything and anything that was before me, and I was unbelievably happy those three weeks. It was so exciting to be an unknown person in an unknown country. I had to go outside of myself, and I know not having my phone was a big help. I will never take my phone with me on vacation again! Great post…kudos on FP, Bill! Where are you at in Italy, currently? I spent 3 weeks in Florence myself!